INTERACTIVE MUSICAL. A mysterious stranger arrives at a village where everyone is grumpy, gloomy, and just plain glum. The stranger’s arrival marks one of the most magical days of the year—winter’s first snow. But the freshly fallen snow fails to cheer up any of the grumpy villagers until the stranger decides to make a magic snowman. 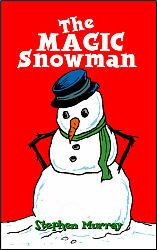 This interactive musical offers an abundance of warmth, spirit, and goodwill that will delight children of all ages. Stephen Murray has been a performing arts educator for more than 20 years. His plays and musicals have been performed throughout the United States as well as in Canada, Germany, South Africa, Singapore, and Japan. He received the Anna Zornio National Children’s Playwriting Award and won the Columbia Entertainment Company National Playwriting Contest. Mr. Murray is also a director, conductor, performer, and songwriter. He has four children and lives in Massachusetts with his wife, Ruth.